This frame was taken by the NASA - Mars Exploration Rover (MER) - Mars Laboratory - Curiosity, on October 23, 2014, during the 787th Martian Day, or Sol, of the Rover's work at Gale Crater, Mars. The foreground (partially obscured by a thick Fog) belongs to the "Pahrump Hills" Rocky Outcrop which is located at the base of Mount Sharp. The Rover's location on Sol 787 can be clearly seen on a map at http://mars.jpl.nasa.gov/msl/multimedia/images/?ImageID=6700. This image - as well as many other data - was included in the first MAVEN (---> an acronym that stands for "Mars Atmosphere and Volatile Evolution") Relay Test that has been sent to Earth via Curiosity's Routine Relay Links using NASA's Mars Reconnaissance Orbiter or Mars Odyssey, which have been orbiting Mars since the AD 2006 and 2001, respectively. The Orbiters' Relay of data sent by both Rovers and Stationary Landers can provide us with the return of much more information to Earth than it would be possible using only the capabilities for transmitting data directly from the Martian Surface to Earth. Electra Radios are already in use on the NASA - Mars Reconnaissance Orbiter and Mars Exploration Rover (MER) - Mars Laboratory - Curiosity. They offer special technical features, such as the capability to autonomously adjust their data rate so to suit variations in the signal strength due to angles and transmission distance as the Orbiter crosses the Sky above the Rover. MAVEN is now examining the Upper Atmosphere of Mars in order to provide a (probably just minimal) understanding about the processes that led to the loss of much of the Original Martian Atmosphere. 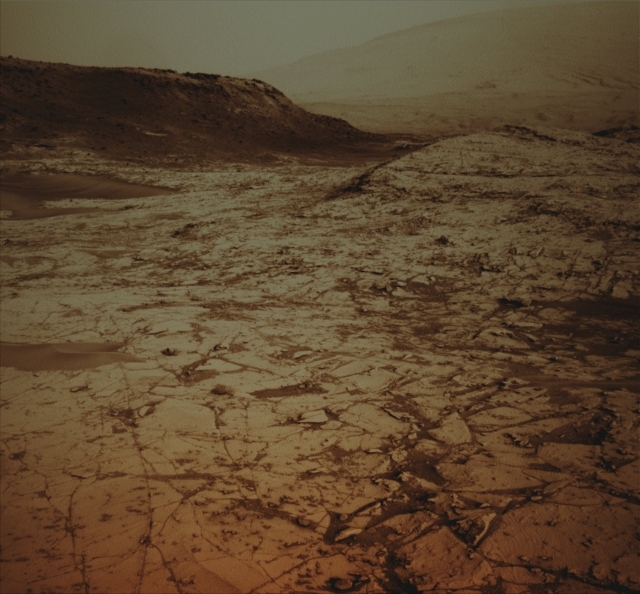 Data and analysis could tell Planetary Scientists a little bit about the history of the Climate Changes that occurred on the Red Planet and provide us with further information about the history of planetary habitability. The NASA - Mars Exploration Rover (MER) - Mars Laboratory - Curiosity has been working in Gale Crater on Mars since August 2014, investigating ancient Martian Environmental Conditions, including the ones that might have been favorable for the creation of Microbial Life. This picture (which is a crop taken from an Original b/w Image taken by the NASA - Mars Exploration Rover (MER) - Mars Laboratory "Curiosity" on October, 23, 2014, published on the NASA - Planetary Photojournal and identified by the ID n. PIA 18866) has been additionally processed, magnified in order to help the visibility of the Landscape's details, Gamma corrected and then colorized in Absolute Natural Colors (such as the colors that a normal - meaning "in the average" - human eye would actually perceive if someone were on the Surface of Mars, near the NASA - Mars Exploration Rover (MER) - Mars Laboratory "Curiosity", and then looked ahead, towards the Horizon and the Lower Slopes of Mount Sharp), by using an original technique created - and, in time, dramatically improved - by the Lunar Explorer Italia Team.